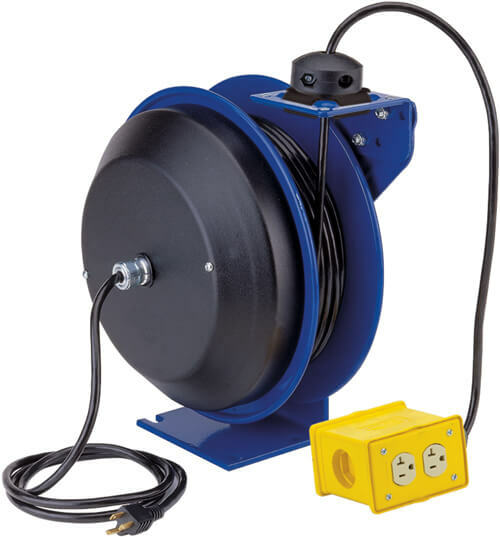 For trouble free performance even under the most demanding conditions, this lineup of retractable cord reels are designed to be long lasting. 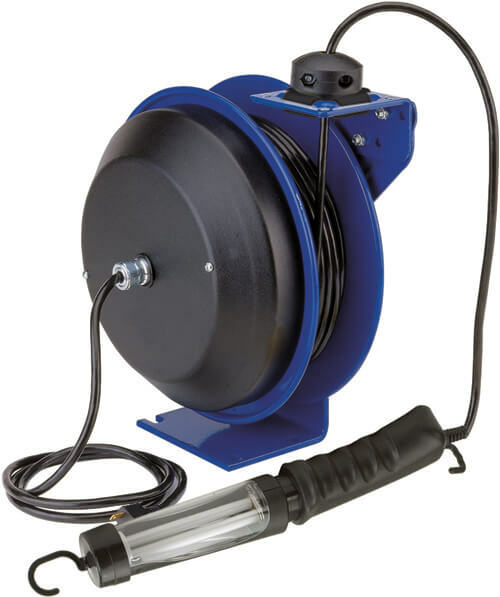 Some common areas where you may find this reel are in retail stores, automotive garages, factories, schools, or hospitals. Anywhere an extension or light is needed temporarily is a good use for this item. Give it one quick pull and it retracts out of the way to prevent tripping or tangling. Electrical cord reels are designed with safety in mind. Come in a blue powder coated finish over heavy gauge steel. The multi-position lock ratchet secures the cord to the desired length. The reels guide arm adjusts to various mounting possibilities. You can mount these on the wall, floor, or even overhead. These retractable cord reels are made in the U.S.A and supported worldwide. These spring driven retractable cord reels are heavy duty, industrial grade power sources. They replace tangled extension cords and self-retract to increase safety, productivity and efficiency. Auto rewind easily wraps, stores, and protects electrical cord.For Indoor Use Only. SINGLE INDUSTRIAL RECEPTACLE - SUFFIX "A"
FLORESCENT TUBE LIGHT - SUFFIX “C” - Shock absorbing & shatter resistant. 1 8-1/2" 14-1/2" 13-3/4" 5" 6" 3"-5"
2 11" 18-1/4" 17-1/4" 6" 6" 4"-5"
3 9-3/4" 21" 19-5/8" 6" 6" 4"-5"
4 9-3/4" 25-1/4" 23" 6" 6" 4"-5"